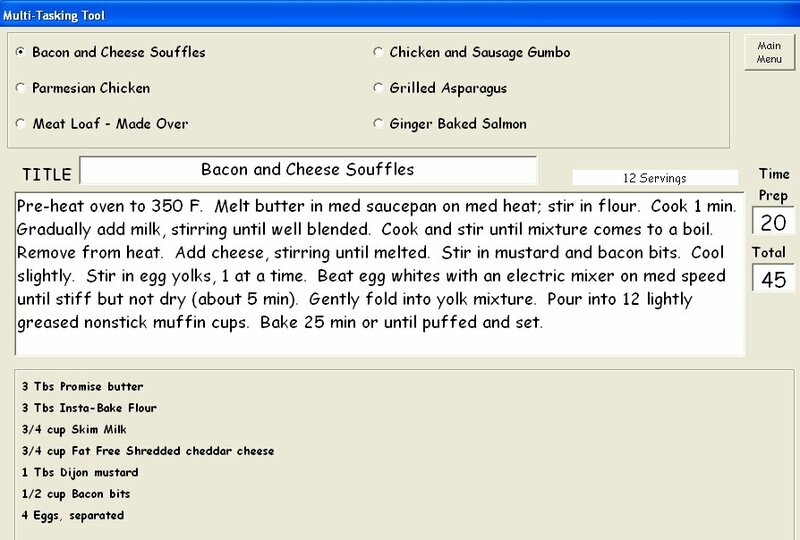 If you like to cook every day, simply use the electronic cookbook or the printouts. If you are like me, you do not want to cook every day. I prefer to cook one day a week, or two at most and re-heat my food. I like to cook multiple dishes at the same time - preparing something on the stove, while something else is marinating in the fridge and something else is baking in the oven. In order to keep my recipes straight, you can either lay out recipe cards or if you have a lap top or a computer in your kitchen, you can use the program to help you juggle multiple recipes. I call it the "Multi Task Tool." It will allow you to select up to 6 recipes, and you can select various amounts of each recipe (in case you want to cook a double-portion or one recipe, and a half-portion of another). First, you select your dishes. Below, I have selected 5 dishes (from the grocery list on the previous page), and I am selecting my 6th dish. Notice that the instructions are in extra-large font. Ideally, you have your ingredients measured out and laid out, and you are looking across the room to your instructions. At the top, you see all of your dishes. To switch between recipes, click the button by the recipe. If you selected a multiple other than "1" (for example, 2 = a double portion of the recipe), all ingredients listed are adjusted. This takes the calculating out of your work. I find this tool also comes in handy on Thanksgiving and Christmas, when I am certainly cooking a lot of dishes. Click here if you are interested in a copy.